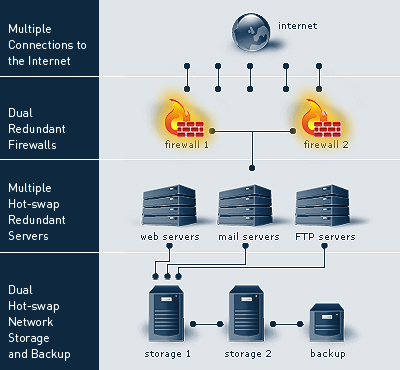 The following diagram represents the Only One Internet web hosting infrastructure. Only One Internet's network operates on industry-leading network equipment from Cisco Systems. All our switches and routers are developed by Cisco. Our network is based on gigabit technology, which means that it runs at a speed of 1000 Mb per second - most web hosting networks are limited to 100 Mb per second. Only One Internet operates a multi-homed network utilising BGP4 technology. Simply put, we have multiple connections to the Internet with different backbone providers, should any connection fail our other connections automatically take all the traffic. Not only does this mean that we are very unlikely to lose connectivity to the Internet, but it also means that traffic moving to and from our network can choose from a range of paths to get to its final destination. This means that we have been able to configure the network always to take the fastest paths.